We all know about F1's gradual shift eastwards in recent decades. It hasn't always been loved either. But there's one still relatively new race that was thought part of the furniture in double-quick time. 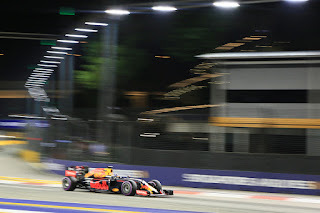 The race is this weekend - the Singapore Grand Prix around the Marina Bay circuit. For several reasons this one feels a lot like the Monaco for the new millennium. It is a glittering, vibrant event in which the visuals rarely fail to look stunning. Just like Monaco, Singapore is a city state that is a quintessential Grand Prix host - glamorous and dripping with money. To the point that you wonder why there wasn't a F1 race here decades ago. Little has been spared in this event. The track goes past many famous landmarks, including the opulent City Hall and Cricket Club as well as proceeding over the Anderson Bridge. Perhaps most importantly the city never fails to embrace its F1 visit. Further when this one arrived on the itinerary in 2008 someone had the bright idea (pardon the pun) to make it F1's first night race. As seen in other sports being run under floodlights adds somehow to the intensity. 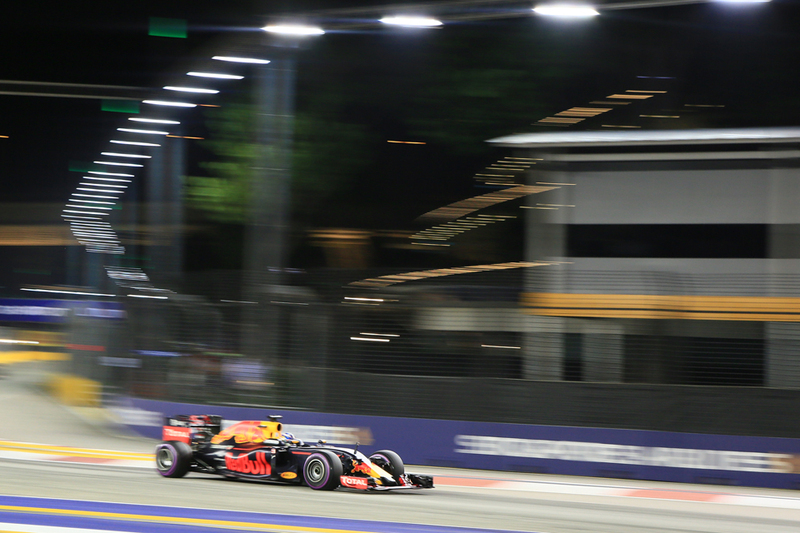 As Daniel Ricciardo noted last year, "it actually feels like you are going faster at night." And it's hard to cite anywhere more befitting a race after hours. In a further nod to the jewel-in-the-crown principality event the Marina Bay circuit is a proper downtown street track - all bumps, city landmarks, nearby walls and regular turns. But just as Monaco does Singapore provides challenges all of its own. Not so much the 30C heat but the crippling 70% humidity that seems trapped within the confines. The race nudges, and sometimes goes over, the two-hour limit in an age wherein no other race gets close (Lewis Hamilton once likened a race here to working out in a sauna for two hours). The acrobatic test with almost constant braking and turning means that the driver has scant opportunity for rest. And walls as noted are nearby to punish definitively even minor lapses of concentration. This one is the year's greatest challenge to mind and body. There is another way that it is like Monaco. As with the principality downforce needs to be maxed here, as at seen at Monaco as well as at Monaco-without-the-houses Hungaroring this year Ferrari is expected to be on top in this one. 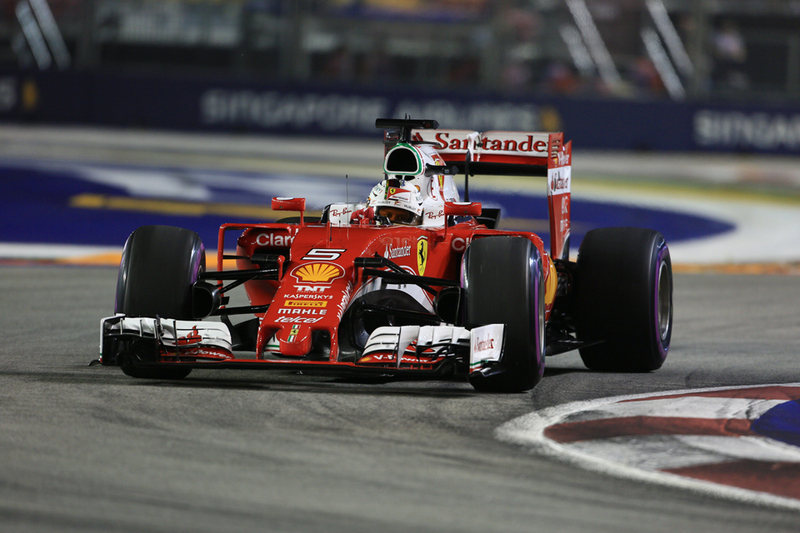 Adding to its hope Sebastian Vettel is quite the Singapore specialist having won here four times. It all couldn't be more of a contrast to high-speed Spa and Monza just passed, and so Mercedes won't view its double win therein as having much relevance for Singapore. Some reckon that Mercedes will view this weekend as one of damage limitation; even that it'd take third place now if offered. It might get even worse for Merc indeed, as it could be not just Ferrari on its mind. Red Bull is another that will have had this round circled on its calendar for a while. High downforce has for years been Red Bull's thing plus it's the third lowest power dependent track on the calendar. Also with its many braking zones energy recovery is not strained. All should minimise the deficit from its still breathless Renault power unit. Last year Ricciardo not only started second but finished in the same place within half a second of the victor (he did roughly the same the year before too). And as it seems to do every year Red Bull is creeping up in competitiveness as the season goes on. It might get worse still for Merc as low grip surfaces with softer tyre compounds have on occasion really flummoxed the silver cars (and this year, particularly that piloted by Lewis Hamilton). 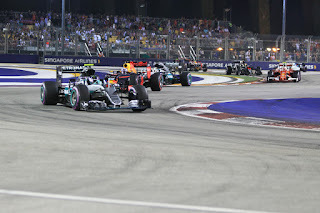 Singapore can flummox the silver squad especially - we can recall indeed this round two years ago when the Mercedes utterly incongruously sank to nowhere. "We are going to Singapore knowing that it could be tricky for us," admitted Merc's Valtteri Bottas in this vein at Monza. "We've seen on circuits that require a lot of downforce, Ferrari has been really strong, also in hot races they seem to be really strong. Even Red Bull can be really good. "So we do have a lot of work to do with the high-downforce package we have. "It's going to be a challenge, and we don't think we are favourites going to Singapore." And yet. Few have got rich in recent years by writing Mercedes off, and last year we were even more convinced in advance that it would be nowhere here. Who got the pole and won? Yup, Mercedes. Others with weaker power units, such as Toro Rosso and McLaren, will also look at this as an opportunity for a better than usual result. Both Fernando Alonso and Carlos Sainz showed up well in Hungary while Alonso bagged seventh here last year and Sainz qualified sixth. They'll in both cases have attention off the track too, as word swirls about their and their teams' 2018 plans. Singapore races come also with a few complications. One is that the race often is a battle for survival. We've spoken about the climatic and other local factors and they're not just for the drivers - it's tough on cooling, brakes and much else on the machines besides. If wheel-to-wheel action is rare here, Singapore races usually are interesting strategic battles - and often off-the-cuff ones. Last year with Mercedes, Red Bull and Ferrari evenly-matched this went a long way to decide the finishing order. Planning too far ahead on strategy in Singapore can be perilous. The chances of a safety car based on previous Grands Prix actually are 100% and their appearances can ruin a few best laid plans. 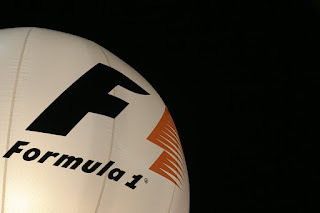 Teams will plan actively for when, rather than if, the safety car arrives. This track also is tough for tyres particularly the rears with its many acceleration zones while big pace differences between compounds have been known here as well. This all ordinarily would benefit multi-stopping, on the latter point to minimise your time on the slower tyre. But at this track there are big competing considerations which will push competitors back towards fewer stops. Overtaking is as tough as you'll find anywhere Monaco aside and the field spread is large too. Plus the pitstop loss time is among the biggest there is - close to 30 seconds - thanks to a lengthy pitlane and a lower than usual speed limit. We've also mentioned safety cars, and they can mess with the multi-stoppers. Reflecting this the field often splits between two and three stops - indeed last year's thrilling finish was three-stopping Ricciardo chasing down two-stopping Nico Rosberg - and on the other end of the scale mammoth stints can be attempted too. Sergio Perez finished eighth last year with an effective one-stopper. Like last year the three softest compounds are brought here though as we know the Pirellis are generally tougher than 12 months ago. It'll be interested to see the impact in this the most challenging of rounds. We can add also that rain, despite being frequent in the area including on Grand Prix weekends, has somehow always dodged the actual running. The effect of rain under the lights, such as on glare and the like, is unknown. Whatever is the case though make sure you're plugged in this weekend for F1's very own light fantastic. 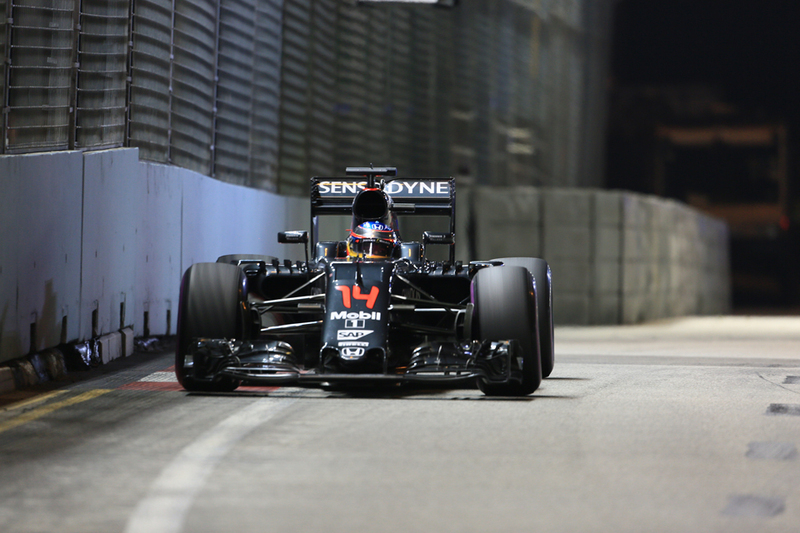 Little is inevitable in the Singapore Grand Prix. Little, that is, besides unpredictability. I dont know what has happened to Ferraris recent race form and they are giving away a lot of points.